The capital city to Latvia and this nation would become the second of the three Baltic nations that I have visited, having previously been to Tallinn in Estonia. But why visit Riga? and what does this city have to offer? Starting with a short backstory, Riga has lived under the reign of many different empires including the Russian, Swedish, Polish and German Empires, and also more famously under the rule of both the Soviet Union and Nazi Germany. It was only in 1991 that Latvia finally became a Republic, and Riga since then has continued under a Latvian leadership. Riga also now stands as the largest populated city in any of the Baltic nations. When I arrived at Riga International Airport, I again decided to use public transport to get the city centre as I more than often do when travelling solo. If you also do this I advise that you catch the ‘Number 22’ bus across the car park in front of the airport, and this bus will take you across the bridge, into the centre of the city and to the edge of the ‘Old Town’. It takes about 25 to 30 minutes and will cost only €2. It is believed that Riga has the largest collection of Art Nouveau buildings in the world and when you come here you will realise that statement is probably true! This is due to the fact that Latvia’s development boom came at the exact same time as the height of the Art Nouveau style era. This is especially seen in the section north of the ‘Old Town’. This is the area I stayed in overnight and is part of a nice grid system with the trams running up and down the roads. There you can also visit the ‘Occupation Museum’ which is inside of the old ‘KGB Building’. It is also full of beautifully coloured buildings that reminded me very much of a Germanic town with many churches and cathedrals dotted around its Old Town. 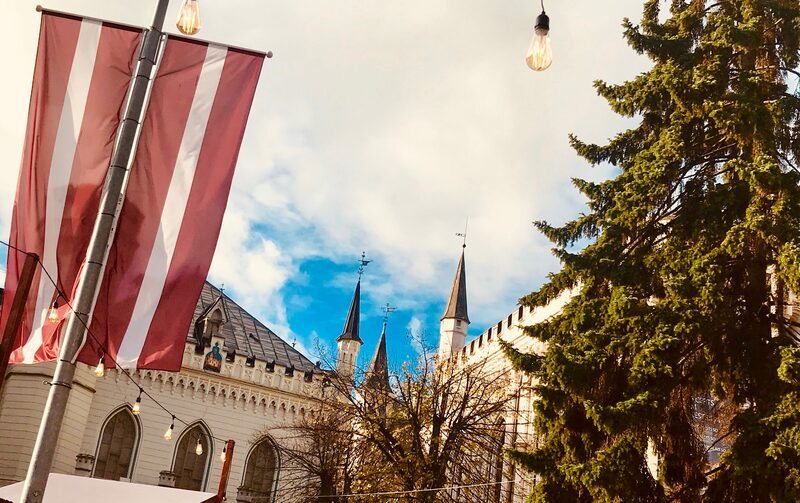 Riga’s ‘Historic Centre’ is actually a UNESCO World Heritage site and hosts places of interest such as ‘Riga Cathedral’, ‘House of the Blackheads’, ‘Freedom Monument’ and ‘St Peter’s Church’. You must pay a visit to ‘Lïvu Square’ which is surrounded by restaurants and bars and the small and large ‘Guilds’. Just around the corner from here you will come across Riga’s ‘Black Magic’ store which sells chocolate and its famous ‘Black Balzam’ spirit and the shop looks like something from a Harry Potter film! The Cathedral of St Mary, aka Riga Cathedral is a Lutheran cathedral and situated not far from the river and has a dark spire with a weathercock atop of it. The cathedral is particularly known for its 1800s German manufactured pipe organ which is a stunning sight to see. I also liked this cathedral for its cloister you can enter and see many of its old artefacts. This is my favourite building in Riga and in my opinion the most beautiful, especially at dusk or at night. Originally built in the 14th Century for rich single merchants (mostly German), so pretty much a ‘lad pad’ back in its day, that stood strong up until 1941 during WWII when ironically after being erected by the Germans, was destroyed to pretty much a ruin by Nazi Germany, and then demolished by the Soviet Union. It’s current standing was only erected from 1995 onwards but what a beautiful building it is! You can still visit the underground sections of the building of which, were not destroyed during the WWII. My recommendation for a restaurant serving regional cuisine is ‘Garden Restorans’ which is just round the corner from ‘St Peter’s Church’. Here I had a potato, cheese and vegetable hot pot kind of meal with a nice dark beer. Really good food! For drinking I would recommend visiting either ‘O’Paps’ and have a pint of ‘Valmiermuiza’ or for a louder scene the ‘Rock Cafe’ which has live music performances from many famous artists on their huge screens such as ‘Queen’ or ‘Coldplay’. Riga certainly has plenty of places to drink at, in a similar way to how places like Tallinn and Krakow do. An ‘Old Town’ littered with bars and pubs with plenty of good beer! So if you want to visit a medium sized city with beautiful historical architecture, nightlife and good beer and food, I definitely recommend a visit to Riga, especially for a quick weekend trip if you are inside of Europe!